Today is Epiphany--and the fact that Epiphany is also the birthday of a favorite professor of mine (I remember this because she wrote a poem called "Epiphany" and shared it with us one semester), combined with the fact that all this just happened to come up in conversation with a friend yesterday morning, prompts me to take a quick break from my book roundup to share about one special book in particular. Dr. Mary Brown was one of my very favorite professors at Indiana Wesleyan University. I started off my first semester in her World Literature class, and I went on to take five more writing and literature classes plus an independent study with her. So to say she had a significant influence on me would be a massive understatement. 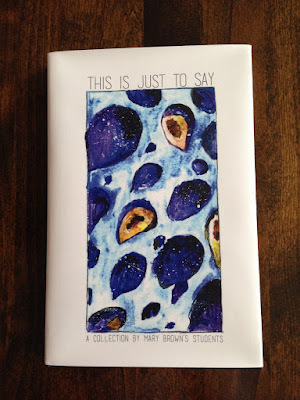 The editors sent out a PDF copy to all contributors, but after reading the lovely preface and the first couple of pieces, I immediately ordered a hard copy of This is Just to Say: A Collection by Mary Brown's Students. The collection is wonderful. 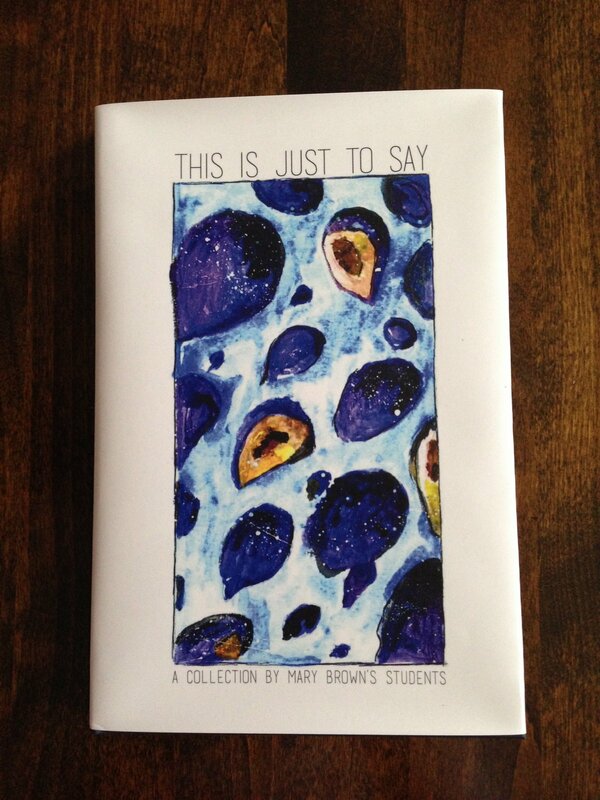 My former classmates--and those who came before and after us--are so talented! And the editors did such a great job putting it all together. I was compelled to look up and contact several people on Facebook just to say how much I enjoyed their contributions. So much powerful, poignant writing--it is a beautiful tribute to a beautiful woman. I laughed out loud, I "wow"ed out loud, I cried...I can only imagine how moving it is to her. Fun stuff. 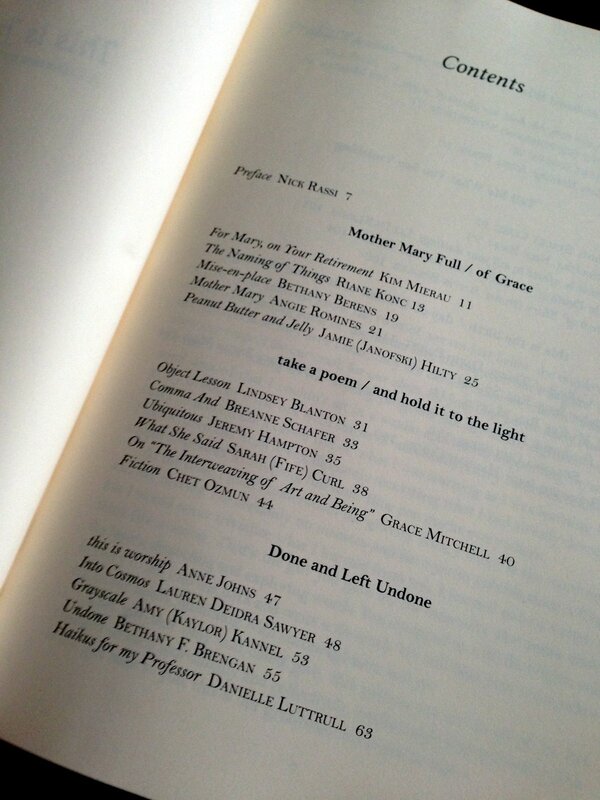 Not gonna lie, it was also fun to see my name in print. It's been a long while since I've had that privilege. My poem, "Grayscale," was an attempt to capture the way I entered college as a very black-and-white thinker and the way Dr. Mary Brown forced me to grow--in uncomfortable but necessary ways--into a more expansive way of seeing the world. I see so much more gray now (much more even than I learned to see in college). That's not to say I don't believe in absolute truth. I do. But my capacity for empathy has grown tremendously, and I am a lot more willing to hold a lot more opinions loosely. SO many of my views have changed over the years, which means I've had to admit I was wrong before (which means I could be wrong again). It would be easier to see things as black and white, for sure--but I've had to embrace the gray as I've realized how complicated and nuanced people and events and systems are, and how limited we are in our ability to see and comprehend reality and truth. When I look back on college, I see that Mary Brown was instrumental in sowing some of the seeds of that growth. bold blacks, wide swaths of white. expertly woven to capture poem-ghosts. the gently piercing murmur of her words. a thousand million shades of gray. I was startled to discover such a world without color. than a stark two-toned diorama. but an endless revelation of gray-turned-grace. Oh this poem is extraordinary! Such beauty in your words and an amazing tribute.